that stretches from ear to ear. At The Little Gym of Boston at Waverley Oaks, our environment is fun, but our purpose is serious. Forget the bug spray and the week-long commitment. Day camp for kids at The Little Gym of Boston at Waverley Oaks is as great as you would imagine. Held during vacation times when school is not in session, our seasonal camps provide kids with giggle-filled relief from the winter doldrums or summer heat. 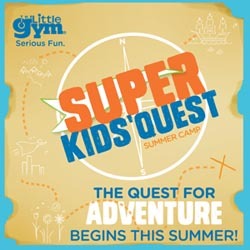 The Little Gym camps combine physical activity and games with arts, crafts and special events. Each week offers an interactive learning theme and each day brings a different, creative lesson plan. Plus, flexible scheduling options allow you to sign up for several weeks, a single week or even just a day at a time. Sound like fun? Of course it is! This is The Little Gym, after all. From 95/128: Take exit 26 for US 20 toward Waltham. Keep straight onto Main St. Make a left on Rte 60 and follow to Waverley Oaks Road. We will be on your right. From RT 2: Coming from West, take exit 56 toward Waverley / Winter St. Bear right onto Concord Ave and then right onto Mill St. Turn right onto RT-60 /Trapelo Rd. Coming from East, take exit 58 onto RT-60 / Pleasant St and continue to RT-60 / Trapelo Rd. Turn left onto RT-60 Waverley Oaks Rd. We will be on your left.